Label statement provides an identifier for a statement that lets you refer to it using a break or continue statement. 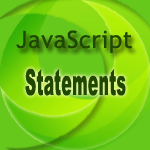 statements: Group of statements. "Break" can be used with any labeled statement, and "continue" can be used with looping labeled statements. The following web document demonstrates how label statement can be used. See the Pen label-1 by w3resource (@w3resource) on CodePen.